Prepared to help you with any and all of your TV wall mounting requests. 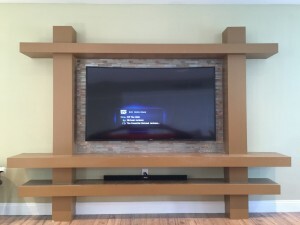 When it comes to your TV installation you have several wall mounting options that make for the perfect living space: mounting your TV without any components showing below, mounting it above a fireplace with hidden components, above a mantle with components in a media niche, or creating a full home theater screen. The options of how and where you put your TV screen are practically endless. However, TV installation on your own can be extremely dangerous, especially when mounting above a fireplace or smokestack. Wires cannot come in contact with or even come close to any excessive amounts of heat or other uncovered wiring or sparks; fires and other dangers may occur, not to mention damage to your equipment. 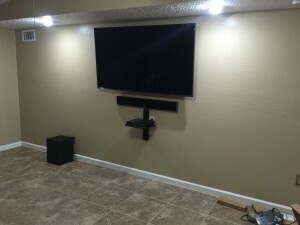 Making sure your TV is mounted with the proper tools and installation techniques is vastly important to ensure you and your family’s lasting safety. That’s where McCray Communications comes in. With expansive industry knowledge and a commitment to providing every client with only best when it comes to products, installations, and customer service, you can count on us to make your TV wall mount installation experience both safe and easy. Why not get the best for less? Call McCray Communications for the best TV mounting Service around!